Infinity/Zero is a revolution in the graphic novel format. With every turn of the pages the drawings animate, morphing into videos with flesh-and-blood actors, and then solidify again into drawings. As you read the captions you listen to the characters talk, their voices arise from a lifelike background, with noises and sounds highlighted by an incredible original soundtrack, composed and recorded especially for this story. 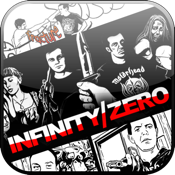 Infinity/Zero is both a graphic novel and a movie. You can leaf through it as it comes to life. It is a cross between a visual story, an audiobook and a concept album. It gives words a new resonance by enveloping all senses. As you turn the pages, you read, look, watch and listen. Dynamic Pictures and Zero Computing are proud to present the result of over a year of painstaking work by a small army of writers, graphic artists, composers, musicians, voiceover artists and computer programmers who have given birth to a new art form which goes beyond what is possible on paper and opens the way to a new form of entertainment. Infinity cannot be divided by zero without creating a mathematical conundrum which transcends into metaphysics, without crashing an application which cannot stand the weight of paradox. But sometimes only the eerie symbiosis of opposites can meet an impossible challenge. A common destiny has welded into an iron pact two teenagers who pledge to fight evil with any means, however quirky, weird, dangerous or extreme. As grown ups, the two become Infinity and Zero. Infinity is a tough fighter, a master of the most esoteric martial arts and a hard hitter. He loves heavy metal but is also intrigued by the classics. Zero is a highly competent lawyer, skilled in bending the law to his own, often illegitimate, purposes. He plays the piano, but his fingers move just as nimbly on the triggers of weapons of any description. "Tortured Beauty" is the first issue of Infinity/Zero. A series of macabre ritual killings is terrifying the city of Florence, in Italy. The "Eyeless Monster" slays women and gauges out their eyes. The police are clueless. Then Infinity and Zero step in.